Hey, folks! Matthew Weiss here — www.weiss-sound.com, www.theproaudiofiles.com. We’re going to be doing a little bit of sound design. This is something where if you were the mix engineer and you did not do the production, you want to try and look at this as something to do with extreme caution, because you’re going to radically change the sound of the drums in doing this, and a lot of times, people are very deliberate about their drum sounds. However, if you’re the producer, or somebody is coming to you looking for that production edge, this can be a really cool technique for turning an acoustic drum sound into essentially the sound of a drum sample, or a drum machine drum, but still retaining the feel of acoustic drums. 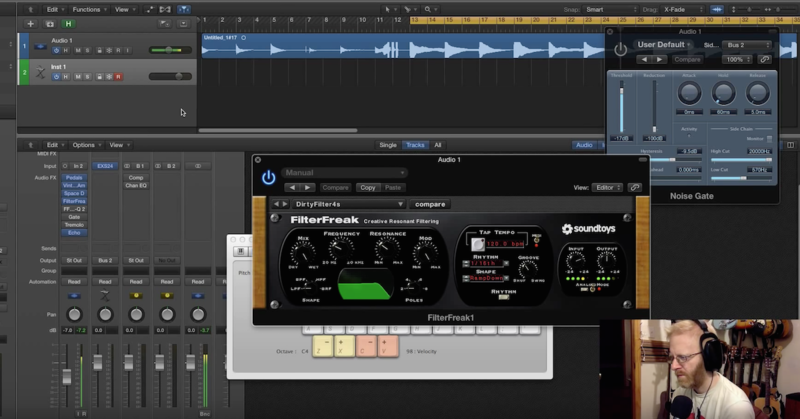 I’m going to activate FilterFreak from SoundToys. 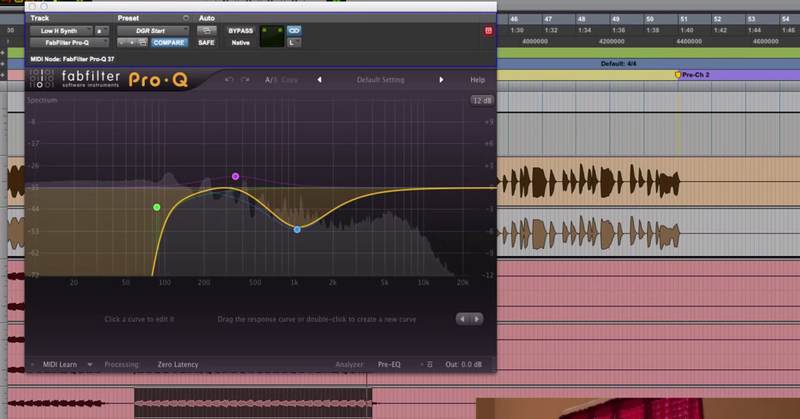 The whole idea behind using FilterFreak to do this is to emphasize the parts of the sound that you want really heard. So, for example, in the snare, what I want to hear is basically the upper mids to treble with a little bit of emphasis on the upper mids, and I want to hear a little bit of this lower range of the snare as well, because that’s the oomph and the body of the snare. So, I’m going to show you how I would deconstruct that by removing this and reopening a new one. Let’s recreate that synthy sounding snare drum. So, what I’m going to do first, is I’m going to turn the gain down all the way on one of these bands. I’m just going to focus on one part of the sound. I know that I want to hear all of the treble range, so on this other band, I’m going to set this over to a high-pass filter. What I’m going to do is I’m going to listen to the corner frequency and move it around until I hear that snap part of the snare. Now, I’m going to start adjusting the steepness of the high-pass, and also this resonance control. Notice when I turn it up to a 4-pole high-pass, it becomes a little more focused on the corner frequency that I’m targeting. Now the other thing we’re going to want is that low-end oomph. So, for that, I’m going to set a low-pass filter, and I’m going to turn the frequency back up. So, that’s giving me that body of the snare right there. I think that it’s a little bit too much in the low-end, so I’m going to turn the gain down. I’ve actually lost a little bit of signal overall, so I can turn this output up a little bit. Then the last thing I can do here, there’s a couple other little controls that I can play with if I want to. There’s this mix knob, where if I want to retain some of the original acoustic drum sample, I can blend it in. That kind of has a cool sound. It has a little bit of a phasey sound. I’m not so sure I dig that much of it, so I’m going to set it all the way wet here. Then the other thing that I can do is this modulation control – modulation is movement of the filters up and down the frequency spectrum. When it happens very quickly, it becomes basically a texture control, and when I say very quickly, I mean the entire duration of a drum hit is maybe about 20-80ms. That’s pretty quick. So, the filters are moving very fast, and what happens is you get this kind of phase distortion, this modulation distortion that happens, and it’s basically a texture control which you can choose to have or dismiss if you don’t want it. So, that’s something that’s there. For this kind of thing, I usually don’t use too much of the modulation, if any. I have a preset that I’ve saved called “Snare Synth Maker.” It sounds like this. So, that’s a little bit more digital sounding. It’s a little bit more artificial, but it’s a cool sound. So I like that. And you’ll notice that I am using a little bit of the mix knob here. It’s blending in some of the original kick and keeping that texture. …We can use one instance of FilterFreak on one, and we can actually use a different instance on the other. And that’s a pretty cool sounding drum machine little drum. The way that it works is the bottom mic here, which is a U48 on the outside of the kick, really plays up both the low end and the high end of the kick sound, but it doesn’t really have too much of that knocky mid. So I’m really exaggerating all of that with this instance of FilterFreak. I’m really exaggerating the sub, I’m exaggerating the treble, I’m eliminating the knock tone that would live in the mid. But, with this other mic, which is a Sennheiser on the beater side of the kick, I’m eliminating everything except for that knocky tone, and I’m blending the two together to get something that has a really cool, punchy, very artificial sound, but it’s compelling and it works. Now, again, the drum texture here has completely changed. I basically changed the entire drum sound. So, if I’m going to do this, I have to pick and choose where this is going to be most appropriate. But, that said, if it is something that I want to do, it’s a tool that I have in my arsenal, it can be really effective, and I actually think that it sounds really good. So, anyway, FilterFreak is another fantastic plug-in. This is something you can do with it that you might not have thought of before. I’ve included a link to a couple of my presets, but obviously, every drum is going to sound different. You’re going to want to make your own for the most part. But still, download my presets, absolutely.